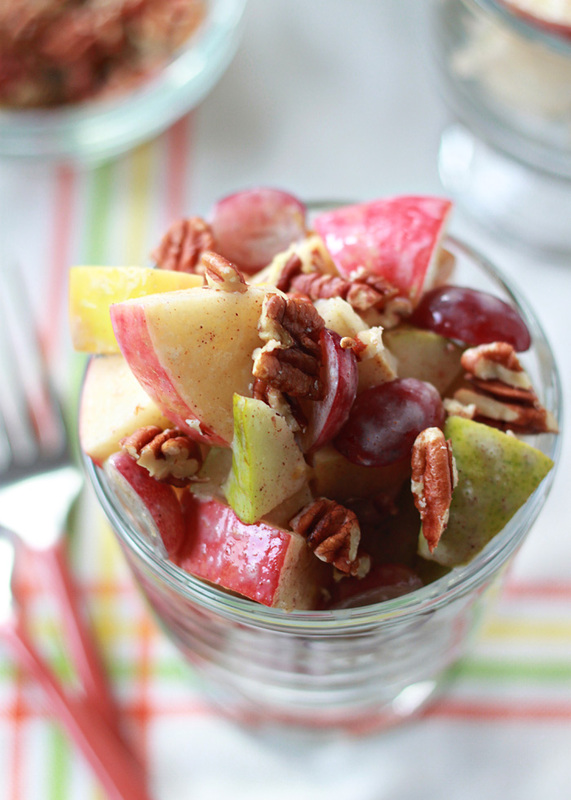 Crisp apples, sweet pears, and juicy grapes combined with sweet-spiced, creamy dressing – and then sprinkled with a few chopped pecans for crunch. Oh, happy harvest! This year, we’re one of those families. You know, the ones who have the Halloween costume set before summer’s even over and their spooky house decorations out by mid-September? Yep. That’s me. For someone who could hardly handle the idea of the end of summer, I jumped head first into fall. It helped that the hot weather just quit cold turkey. No pun intended. But seriously, autumn came in an instant this year. It was so weird. But, just as suddenly, I was cool with it (also no pun intended). I’ve embraced cozy sweaters, the fact that we’ve had to turn our thermostat back on, and fall produce. Pumpkins! Squash! Crisp right-off-the-tree apples! Oh, happy day. This fall fruit salad came to be a couple of weeks ago when an awesome neighbor bought a couple of 40 pound boxes (!!) of honeycrisp apples and divvied it up amongst several of us. The next morning, I peered at the happy-making bowl of honeycrisps gracing our kitchen counter and I decided that a reverse of my usual breakfast – yogurt with fruit on top – was in order. So I made this fruit salad for the first time – with honeycrisps, some ripe pears, and a few plums I had on hand, and a dressing made with Greek yogurt. Yum. The dressing came together flawlessly the first time I took a stab at it (I love it when that happens!) – a little of this, a little of that, perfect! The fruit, I ended up tinkering with a bit to end up with this final result. I decided I favor red grapes over plums; crisp pears work better than softer varieties – and if you can’t find great pears for this salad, you’re better off leaving them out and throwing in extra apples and grapes. Right on cue (I know, I know, it’s not even Halloween yet!) I’ve got to say that I think this would make the perfect Thanksgiving side dish. Hey, it’ll be here before we know it! 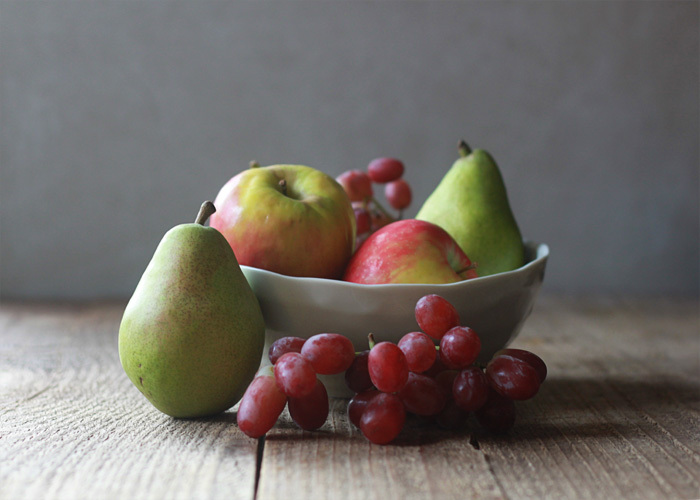 Place pears, apples, and grapes in a large bowl. Toss gently to combine. Set aside. To a small bowl, add the yogurt, lemon zest, lemon juice, maple syrup, vanilla, cinnamon, and nutmeg. Use a wire whisk to blend well. Drizzle dressing over the fruit. Toss gently until fruit is coated. 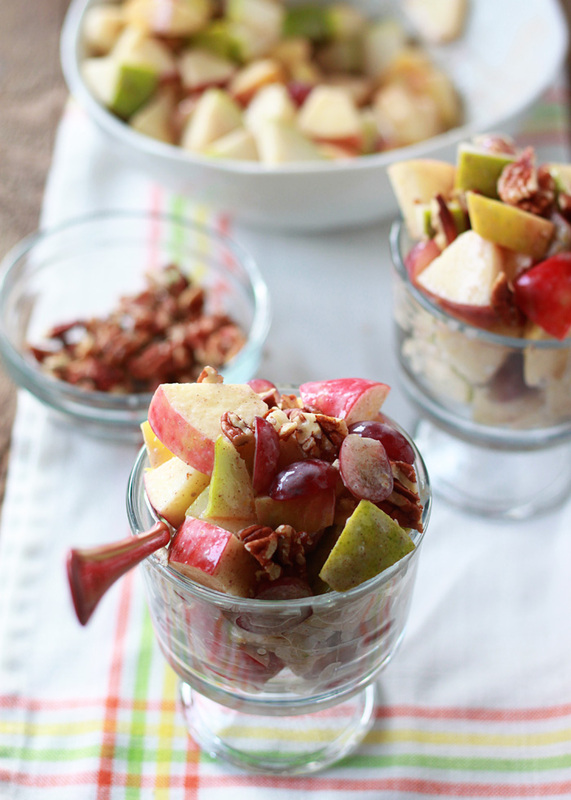 Scoop into bowls and sprinkle with pecans. Serve immediately. 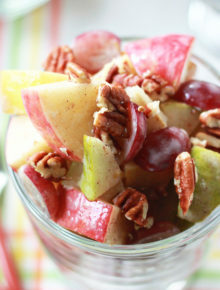 *If you prefer to make this without the pecans, just leave them off – it’s still plenty delicious without them. Use your favorite non-dairy yogurt, either plain or vanilla. Depending on how sweet your non-dairy yogurt is, you may want to adjust the sweetener. Follow the dairy-free option and choose pure maple syrup for the sweetener. The salad tends to get a little watery if it sits for long, so I recommend keeping the dressing and the salad separate until right before serving. Also, if you cut your fruit far ahead of time, try tossing it with a little fresh lemon juice to help keep it from browning. Hi Kare! This is such a simple and refreshing combination. The lemon zest just brightens it all up! 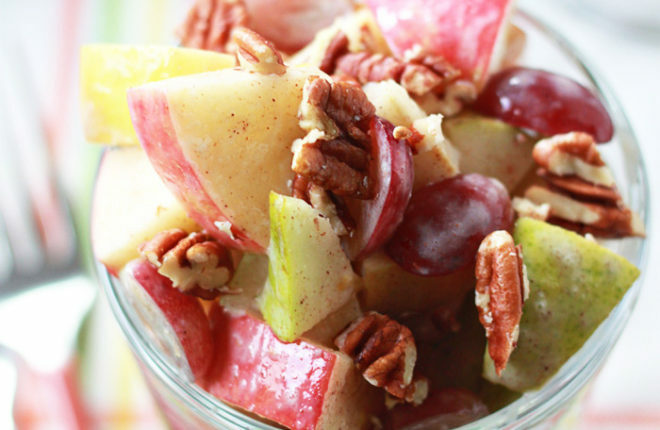 And although fall has blown in, aren’t the cozy sweaters, pears and fresh apples the best!? Thank you for your delightful recipe! Our spring seemed to come in an instant too! The seasonal swap sure was quick this year! 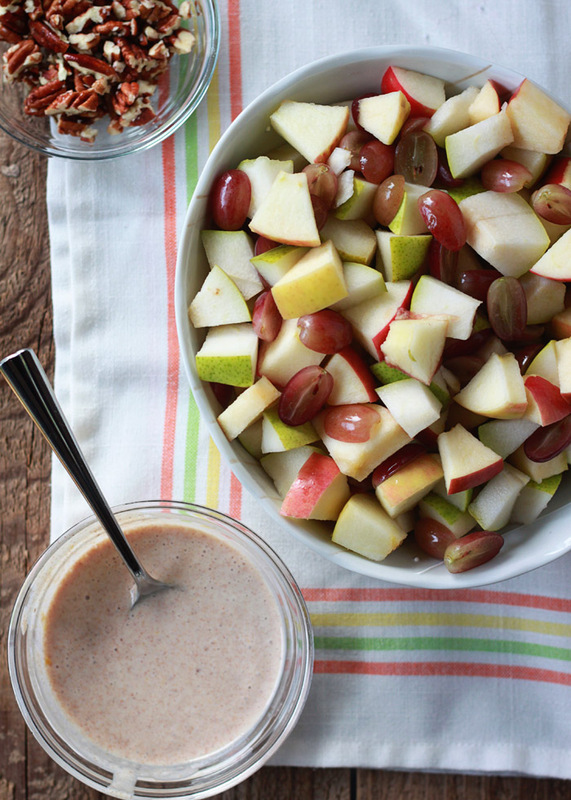 I love the idea of an autumn fruit salad with spiced yoghurt dressing! All those delicious flavours – yum, yum! I made this last night, and it was really good. I used regular plain yogurt, because I didn’t have Greek yogurt on hand. I drizzled about 2 Tbsp of the dressing onto the fruit and it coated perfectly — just a touch of flavor to accent crisp fruit. I will be making this again! I teach kids how to cook and we used this recipe. I did it at four different schools and the kids loved it. Thanks! Just made this tonight and it was wonderful! Thank you. Pinning! Has anyone calculated the calories per serving? I would love to know. Which flavor of greek yogurt do you use-plain? This looks SO good! I recently made this (actually made way too much)! After it had sat in the fridge for a few days, it got a little watery, as you said it would. So I through it in the blender, added a little more Greek yogurt and ice, and had a really awesome smoothie for dinner! I’ve been looking for a fall fruit combo to serve at a ladies brunch in a few weeks.Even though I haen’t made it, I know it will be perfect!! Thanks for sharing!! Wow!! Of all the fall/Autumn Fruit Salad recipes online, my daughter and I thought this one looked and sounded best. My 11 year old daughter is always throwing things together for a delicious treat for our family. We are definitely excited to try this one! Thank you for sharing!!! We were surprised last evening when our daughter served up this incredibly simple, yet, amazing fruit salad. The flavones rang true and sang to us. Great starter or Snack ! A Diabetic Dream Dish. I made this salad for a halloween breakfast with some friends and it got rave reviews from everyone. The dressing was excellent. Perfect for fall!!!!! Just made this for a breakfast for 30 guests today. They all enjoyed it very much and kept asking me the ingredients! I’ll definitely make it again. Could you use whipped cream instead of yogurt? I haven’t tried it, but it would probably be delicious. If you try it, please report back! Thanks for the review, Eric! I’m so glad you like it.